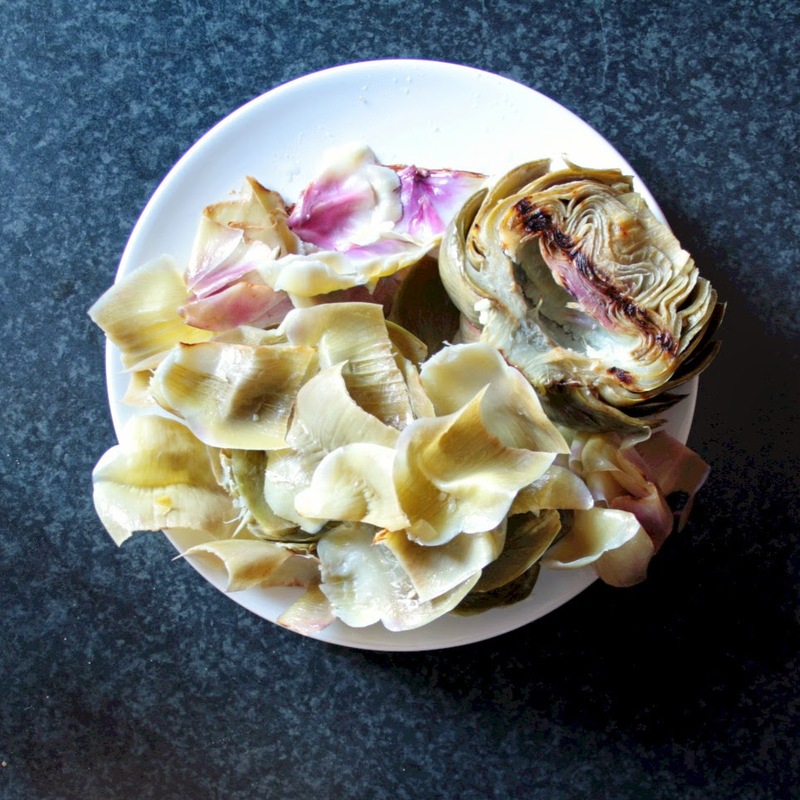 If you've seen my Twitter feed over the last couple of days you will have seen that I have been having a bit of a fling with artichokes. I've had artichoke hearts in the past but they've never really been on my food radar...until I bought a pizza. Waitrose do a "Four Seasons" pizza which I bought a couple of months aso. It triggered some crazy artichoke button in my brain. 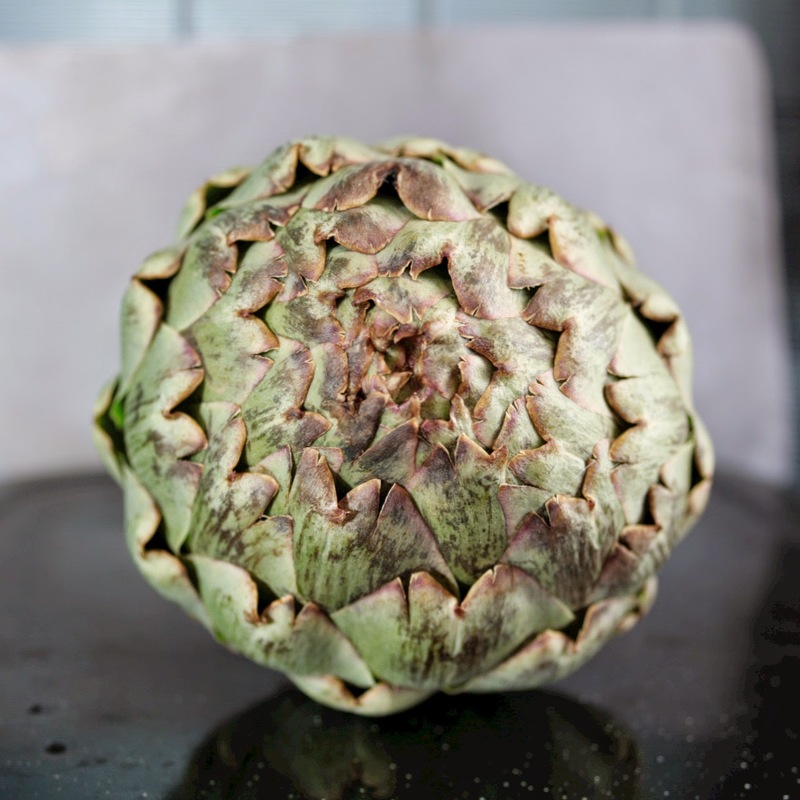 Although not easy to find I've been surviving on canned artichoke hearts alone (that's a lie, I eat other things too..) and have been on a mission to find an actual artichoke that I could take home and get to know better. 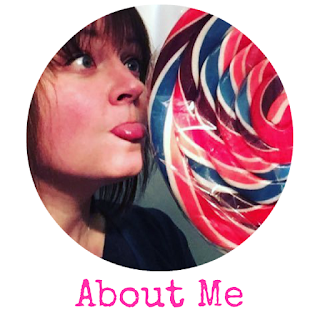 I scoured the veg aisles of the supermarkets including a huge branch of Tesco but alas, no artichokes. It was only when I stopped at my local Waitrose that I found my much desired veg. They actually had about 10 of them! 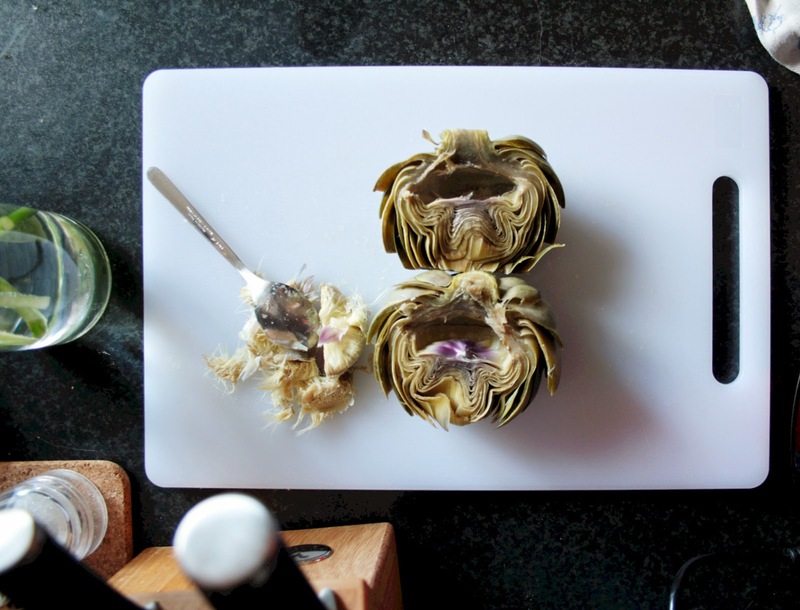 After spending a lot of time looking up artichoke recipes I started to get excited. Why? Inside that weird looking bulbous veg are layers of colour and texture and I honestly couldn't wait to get cooking! I love the artichoke flavour on its own so wanted to make something that was lightly flavoured but focussed on the actual artichoke flavour. 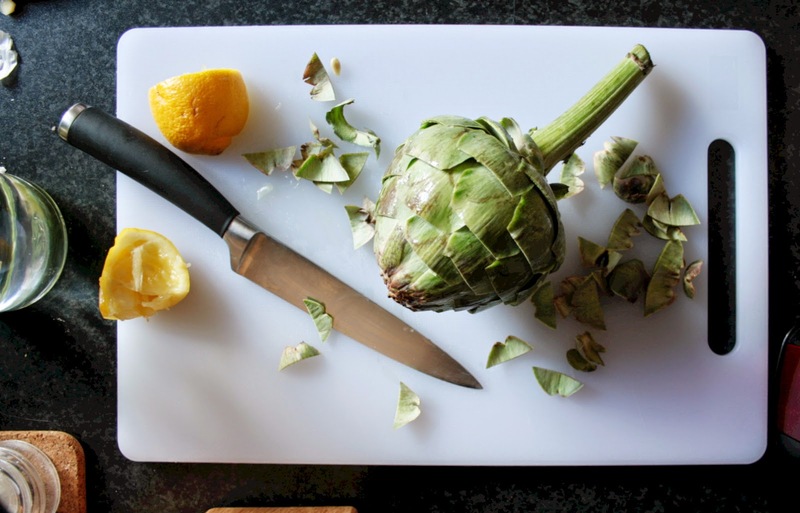 When preparing an artichoke it browns quickly but if you rub it with lemon it saves it from browning. Pretty handy because not only does lemon help stop the bulb browning, it is one of the flavours involved in the recipe! 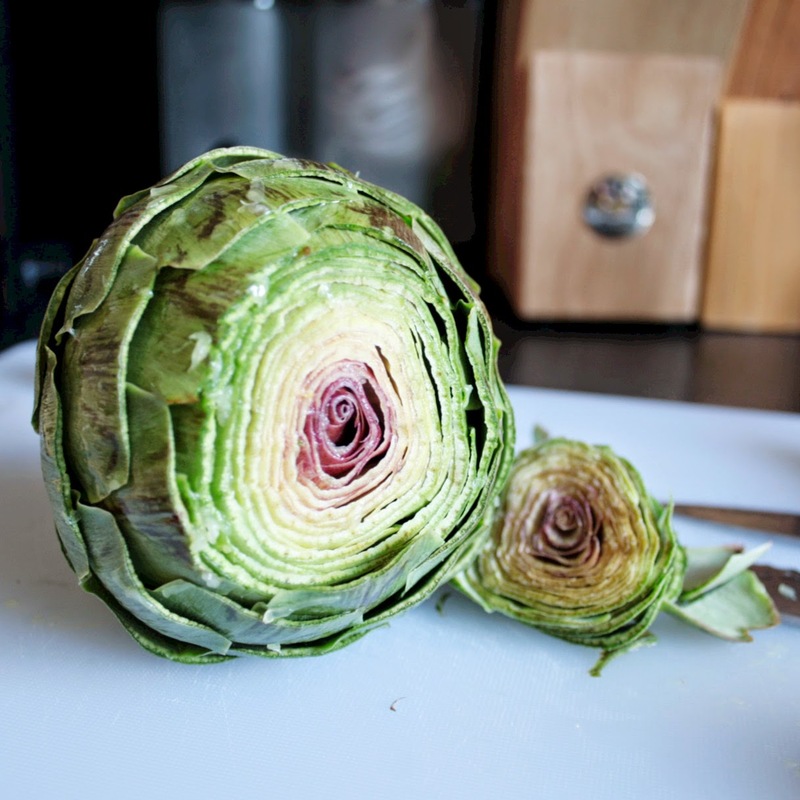 Fill a large pot with water, add a pinch of salt and bring to the boil while you prepare the artichoke. 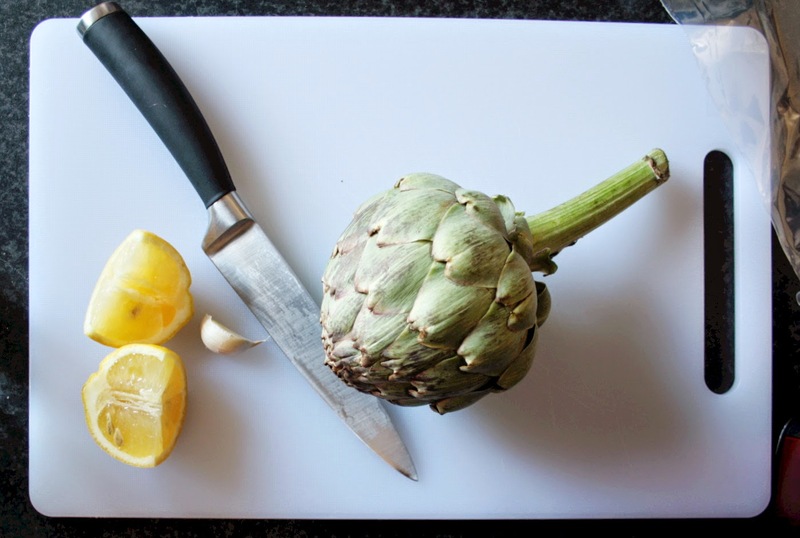 If you have a slightly stemmed version, chop off the stem, rub the end with lemon juice and put aside until later. Trim off those potentially dangerous leaves (finger cuts!) that surround the asparagus bulb then rub with a lemon. Slice off the top - I found that using a serrated knife works best. Again, rub with a lemon once cut. 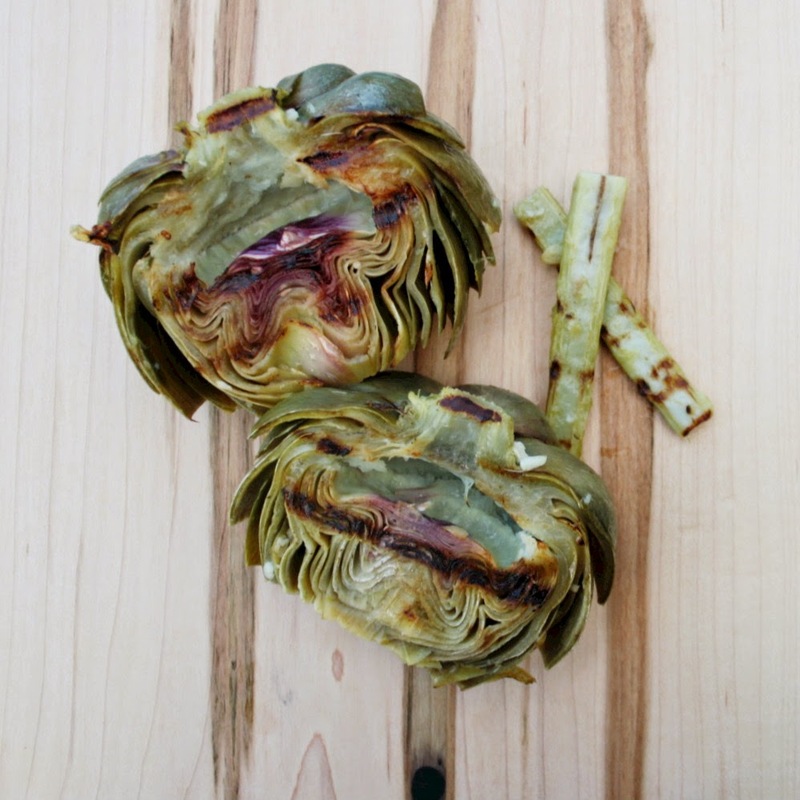 Cut through the artichoke lengthways and rub with lemon. This was the bit I was most excited about - look how beautiful the insides are! 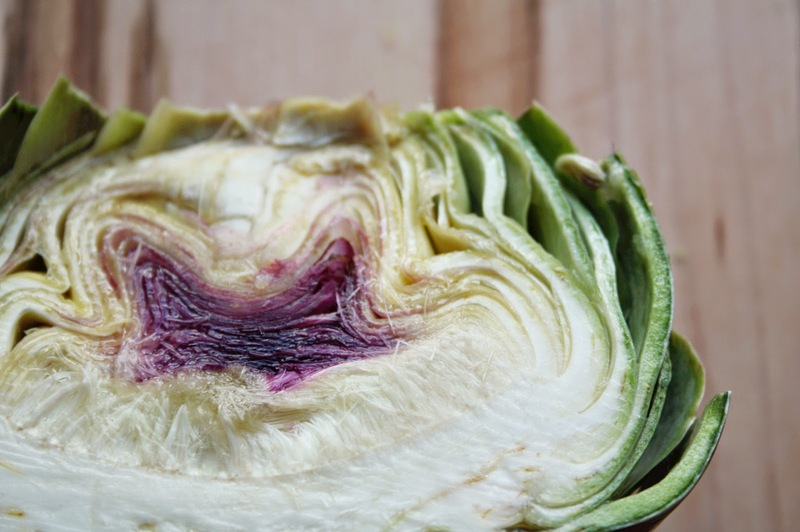 Add the artichokes to the boiling water and boil for about 15 minutes or until the heart is tender. 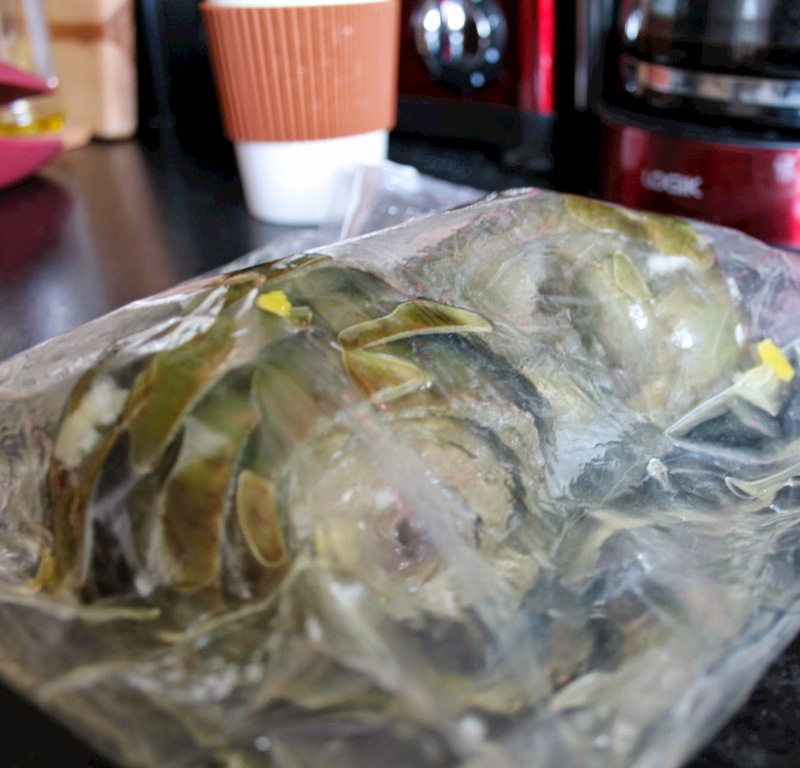 While the artichokes are boiling add the oil, garlic, wine, ginger and lemon zest to a plastic bag. Top tip - if you're adding wet ingredients to a bag for a marinade, tuck into a glass or mug so you can pour the ingredients into the bag without worrying about it falling over and spilling! 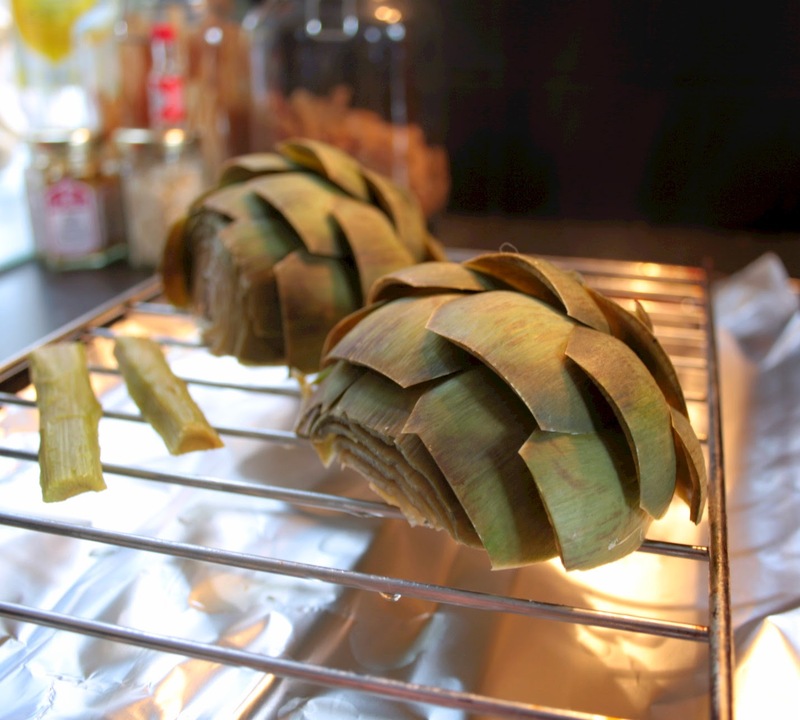 Drain the artichoke halves and stems and allow to cool. Once cooled scoop out the furry choke, add the halves to the bag with marinade and give them a good toss around so the marinade gets in all the nooks and crannies. 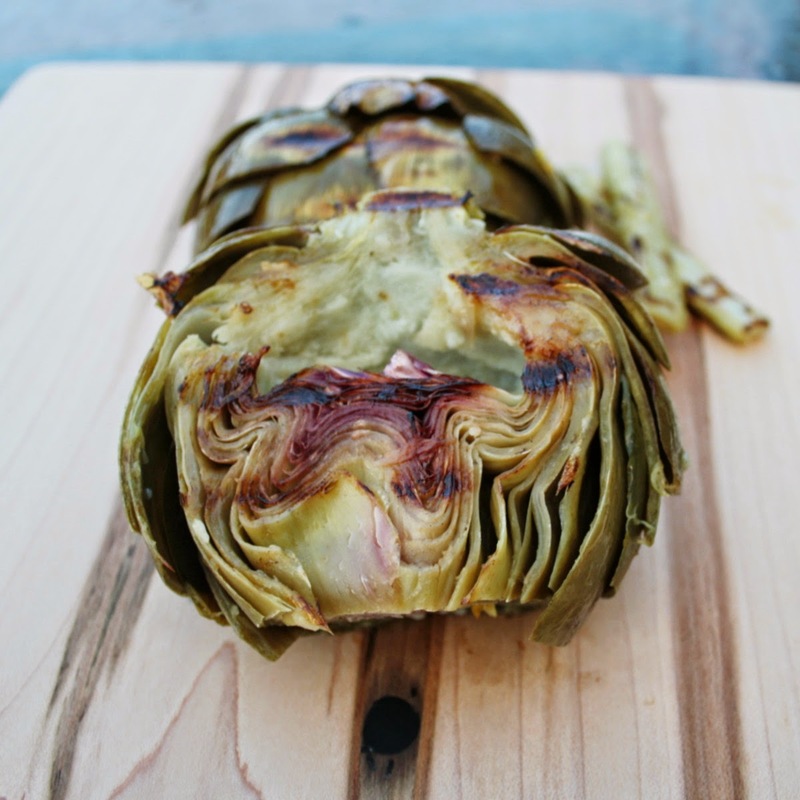 After half an hour take out the artichoke and grill on a hot grill for up to 5 minutes on each side - the boiling will have cooked them through so the grilling just finishes it off and you get delicious charred pieces. Plate up and tuck in! I would highly recommend just getting stuck in with your fingers like I did!